For the Japanese folks, this info is a bit old. But I realized talking with non-Japanese folks that many of them didn't know this so I thought I'd write this post. ... I sometimes do this in U.S. when my stay is long. But it is annoying to do this in each country you go, you don't know the language and you don't know the pricing models in that country, you don't know which career is good etc... it is painful. @miyagawa taught me an awesome wiki "Pay as you go sim with data Wiki"
See also his blog post "Hacking Japanese mobile plans for geeks (or travelers)"
Thank you for the info Miyagawa-san! ... this is what people usually does. 4) use the SIM from the country of origin and use it as you want to. 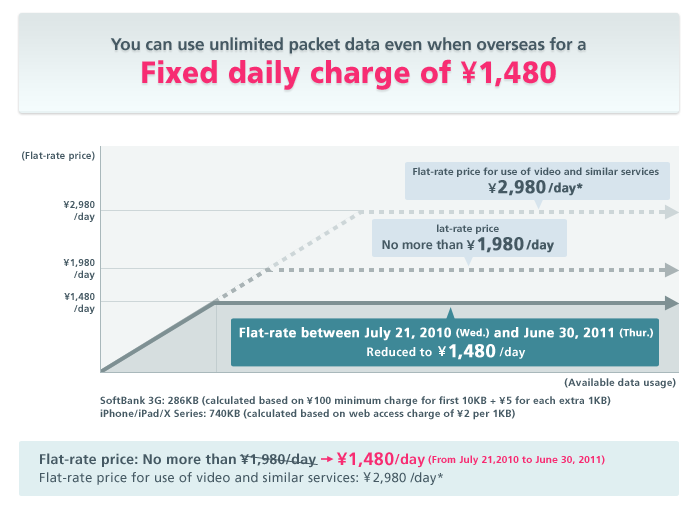 ... this is called "パケ死 (packet death)"
In order to solve this problem, Japanese mobile carriers - Softbank and NTT docomo started to provide flat rate international roaming packet services several months ago. User: Can't you do anything about the ridiculously expensive international roaming cost? 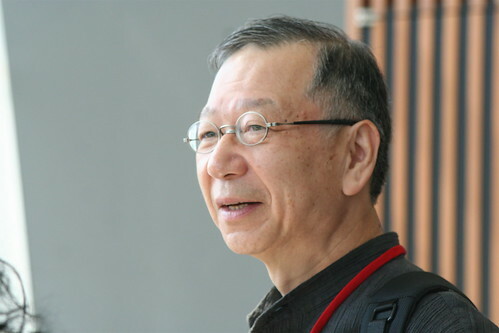 Son-san: Let's consider providing flat rate international roaming packet service from countries that are possible. User: Son-sama, if you can make the packets I tweet overseas a flat rate, I will run to Softbank shop and switch to Softbank now! Son-san: Will consider providing it from countries that are possible. User: Even if iPad is SIM locked, it would not be a problem if global roaming fee is fixed price. Son-san: Let's do it. From major countries. 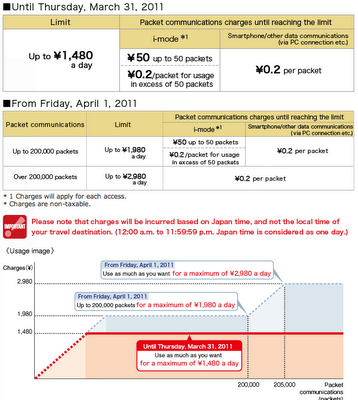 Flat rate international roaming packet service. User: Please do it with iPhone too. 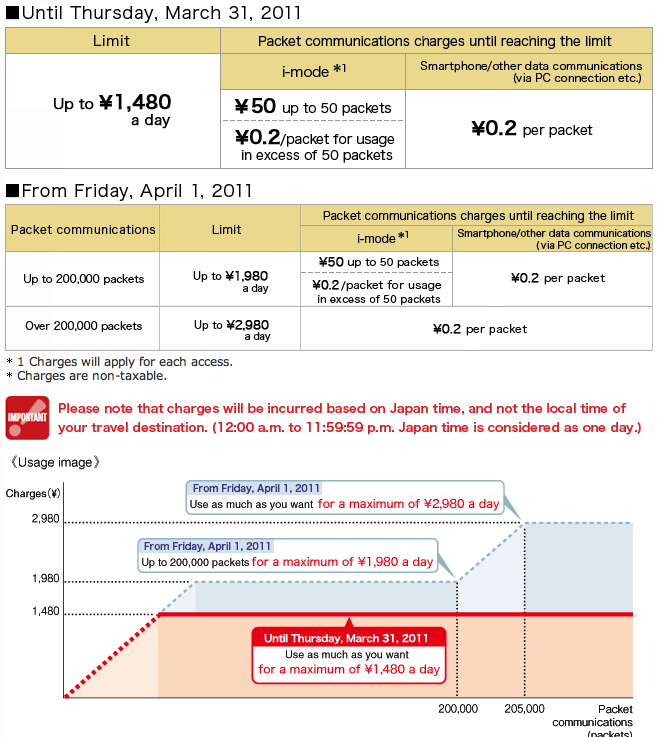 User: I can't use (data) outside Japan with current price setting! Son-san: Fixed. We will start flat rate international roaming packet service from late July in major countries. Details to follow. 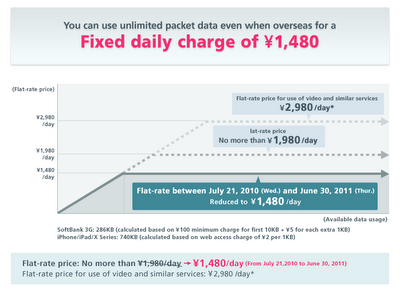 Softbank needs to pay other carriers - is it really possible to do flat rate? Son-san: If you use too much, we will be in the red. Please don't be too hard on us. The opinions expressed herein are my own and do not represent my employer’s views in any way. Nothing posted here should be considered official or sanctioned by my employer or any other organization I’m affiliated with. World Cup Soccer - Go go Japan! FIFA World Cup Soccer Tournament is held right now in South Africa. Many Japanese soccer fans flew to watch the matches. Japan is ranked 43rd in the FIFA ranking, and it is our 4th participation in the matches. Despite all the pessimistic views before the tournament, Japan ended the group stage matches with 2-1 result (won against Cameroon and Denmark, lost against Netherlands) and made it to the knockout stage... yay! 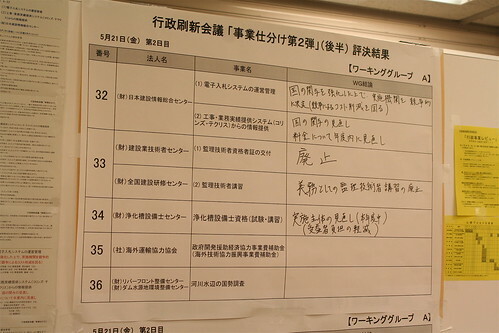 The next match for Japan is against Paraguay, will be aired on TBS television on 6/29 23:00 Japan Time. Update 6/30: Japan lost the match vs Paraguay (PK) but it was a very very close match. They did a really great job! 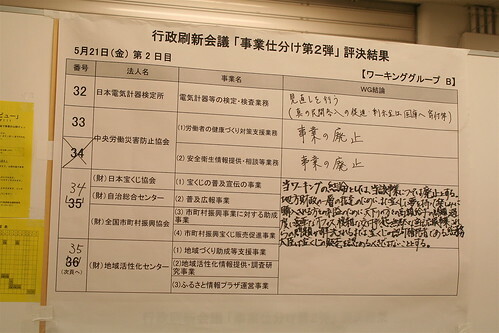 Japan co-hosted Worldcup 2002 with South Korea and is bidding for hosting Worldcup 2022 now. 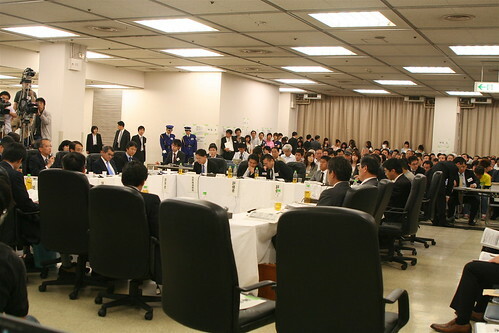 As you can see from the video, Japanese bidding team is trying to use various technologies to make the experience richer... automatic interpretation device to communicate, augmented reality (AR) devices will be provided to view information of the players etc realtime, " Freeviewpoint Vision" will capture videos in the soccer field using 200 high definition cameras, "Full Court 3D Vision" enables the viewers to watch the matches using 3D technology, etc. They even had a PSP in their official "bid book"
This is the photo of the bidding team which I took at their report event after the official bidding. 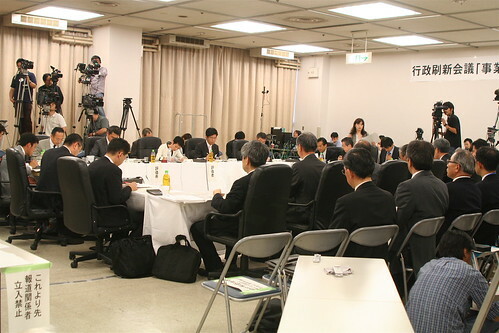 2nd from the right you can find Professor Jun Murai- father of the Internet of Japan joining the bidding team. 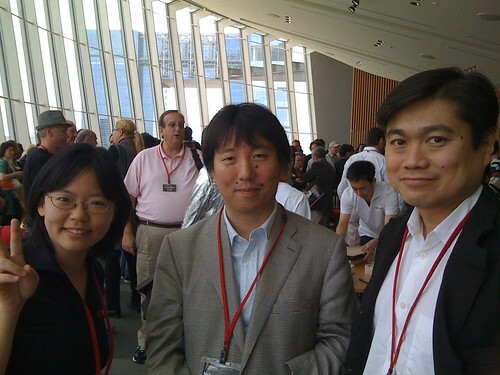 Last month on May 15th, I was involved in organizing an event called TEDxTokyo 2010. TED stands for Technology, Entertainment and Design, it is an invitation-only annual conference held in long beach, with amazing speakers and participants from all over the world. 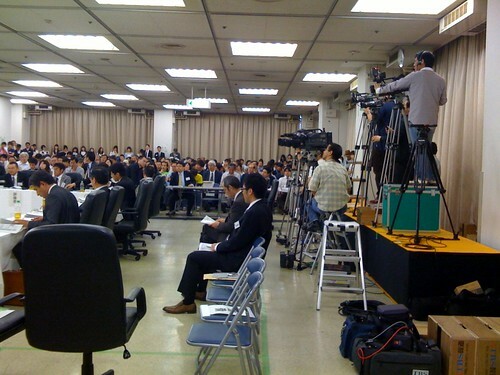 Originally it was a closed conference, but they started to provide their video online using Creative Commons license which helped them spread the word. They also launched a translation project with which 4,000 volunteer translators worked on over 9,000 videos to 77 languages so far, which helped non-English speakers all over the world to learn about, and learn from TED conference videos. TED licensed their brand for free as "TEDx" so that anyone who abides to the TEDx guidelines are able to hold their own TEDx event. They can either view the past TED videos together or invite their own speakers to talk. During the past year, 1,000 TEDx events were held all over the world in 70 countries with 35 languages, and more than 50,000 people participated. It is becoming a big phenomenon. The great thing about TEDx is that people around the world are using their own creativity harmonizing with their own expertize and culture to make interesting events happen, and most of them are streamed live and/or video recorded and uploaded on YouTube. If you go to this channel, you'll be able to find tons of interesting videos from TEDx all around the world (1,874 videos as of 6/26）. 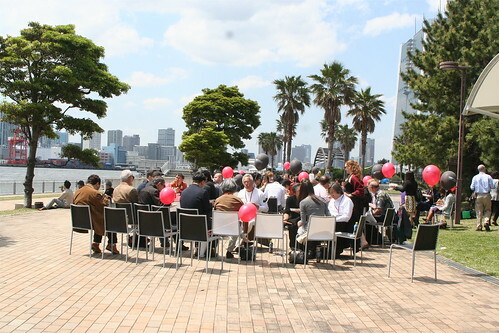 TEDxTokyo is one of the TEDx events held in Tokyo, we held 2 TEDxTokyo events so far, one on 2009/5/22 and another on 2010/5/15 both of which were amazing and I am very proud of being in the organizing team :) I was serving as social media Japanese lead in charge of @TEDxTokyo_ja (Japanese language tweets). 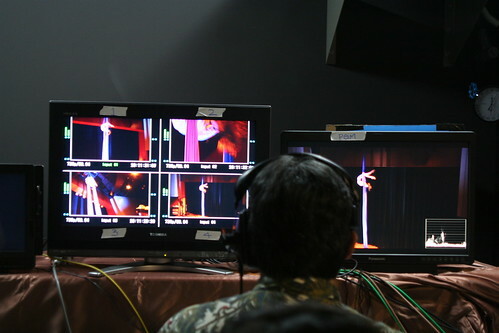 One of the great things about TEDxTokyo is that everything is operated as volunteer work. We as staffs met up at 7AM in the morning at the venue (Mirai Kan). It was a great sunny day! 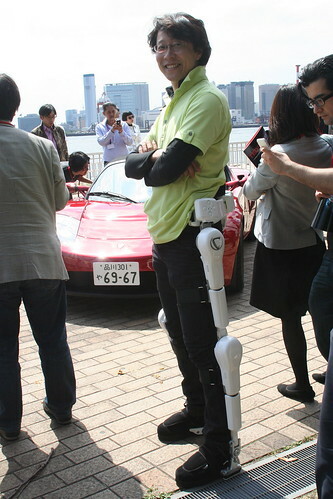 Some speeches were about advanced technology of Japan, Dr. Yoshiyuki Sankai showing his HAL system which is a robot suit that enables the disabled people to stand up or walk, weak people to hold heavy loads etc. 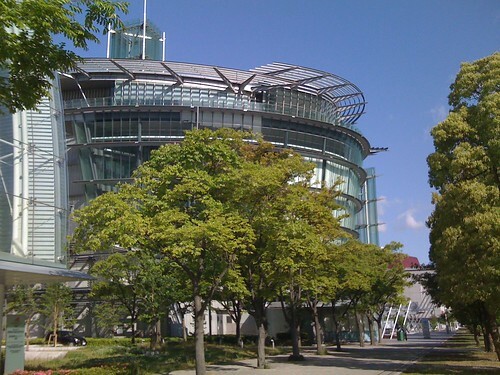 Morinosuke Kawaguchi talks about the Japanese super-advanced toilets. 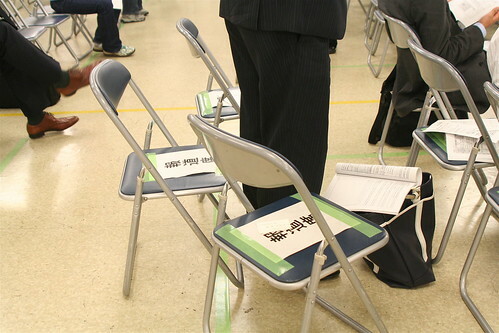 Some talked about the lost values of Japan. Dr. Hiroshi Tasaka talks about the age of "invisible capitalism". Azby Brown talks about how the sustainable practices of the Japanese Edo era can serve as a model for the modern world. Some talked about how Japan can contribute to the world- Kentaro Toyama talks about The Technology for Emerging Markets research group which investigates ways the world's poorer communities can harness technology to drive their socioeconomic development. Kanae Doi shares her experiences from NPO "Human Rights Watch" on how Japan should be helping more refugees around the world. Jakob Lusensky talks about branding using music, but the presentation was received by the audience that his insights can be applied in various areas. Industrial designer Kiyoyuki 'Ken' Okuyama shares his thoughts on how society and space is changing and how companies/people should change the way design spaces and products to meet those changes. 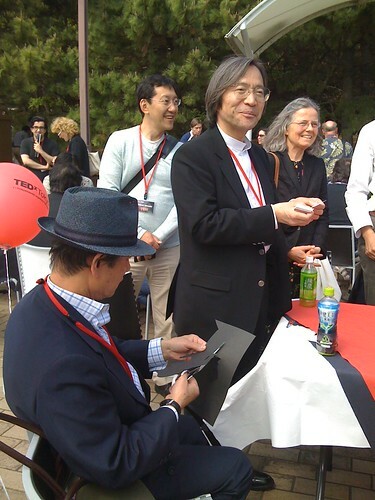 The other great thing about TEDxTokyo is that it is basically invitation only, and the audience are amazing people as well. Some of the speakers this year were audiences last year, and some of the speakers from last year came again as audience this year. I think it is becoming an amazing community. Joi who couldn't join last year participated this year as an audience. As the organizing team is volunteer work too, the video shooting and streaming team brought their equipments for free and worked for us. It was amazing. There were amazing things happening even outside the main hall. Rinpa Eshidan was live painting the walls during the event. If you are not familiar with Rinpa, check out this video. I'm a big fan of them. Lunch time was fascinating too. Lots of interesting people, doing interesting things. I would like to thank all the speakers, sponsors and partners, organizing staffs and volunteers, audiences at the venue as well as on the live stream! Also, many thanks to the social media team- Steve Nagata, Joseph Tame and Paul Papadimitriou! Thou Hast Never Shared Before. 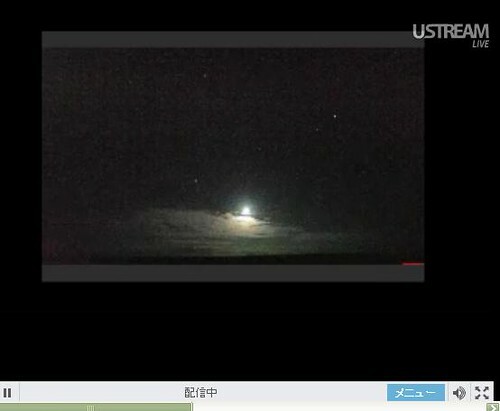 Last night, Japanese netizens were filled with excitement watching Japanese spacecraft "Hayabusa" return from its 7 years mission to explore asteroid "Itokawa". Hayabusa's trip was not easy- it lost communications with the earth, had various technical problems. But the Japanese scientists had overcome such difficulties and brought Hayabusa back home, which was bound to explode entering the earth's aerospace to bring back a capsule containing a sample of Itokawa and land in Australia. If the capsule indeed carries a sample of astroid, it will be a big scientific success as it will have precious clues to understand the origin and evolution of the Solar System. BBC "Japanese Hayabusa asteroid mission comes home"
BBC "Who thought asteroids were dull, dumb rocks?" BBC "A perfect view of the asteroid capsule's Earth return"
Although this mission demonstrates an excellent example of how Japanese scientists had overcome difficulties and achieved a world class success, none of the TV stations reported this live - yes, they were reporting world cup- and people watched live streams from Ustream and NicoNicoDouga and shared their excitement on Twitter. 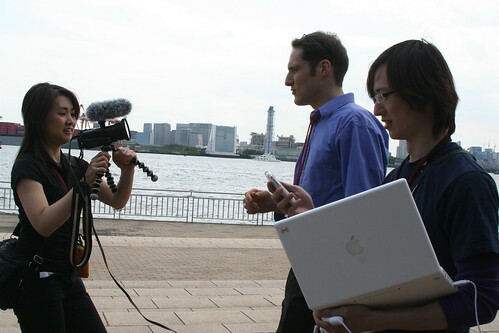 This is an archive of Ustream by Wakayama University. 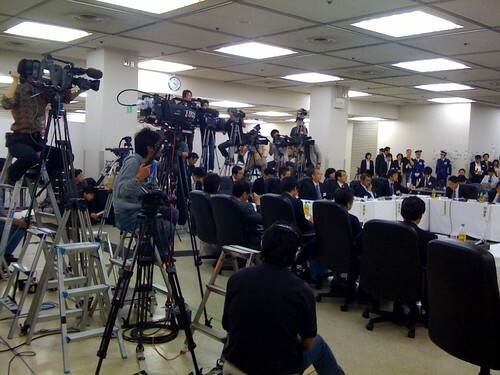 As you can imagine, people were tweeting heavily about Hayabusa, and Hayabusa was tweeting too. "Hi everyone, I'm home" tweet by Hayabusa. You can see how Japanese netizens loved Hayabusa- Hayabusa cosplay of a girl with Itokawa at Make Tokyo Meeting 05. Someone created this "Welcome home" message for Hayabusa using Google Earth. A figure characterizing Hayabusa is going to be on sale. May 9, 2003 Launched by the M-V-5 Rocket from Kagoshima Space Center. May 27, 2003 Ion Engine operation started. 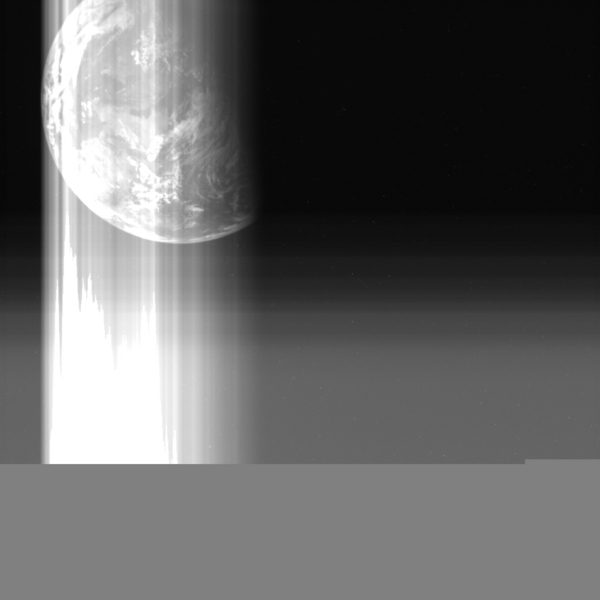 July 29, 2005 Performed the Star Tracker imaging of Itokawa. September 30, 2005 Arrived at the Home Position (about 7km away). November 12, 2005 Released the probing robot ”Minerva”. November 20, 2005 Performed the first touch down and release of the target marker with 880,000 autographs inside. November 26, 2005 Performed the second touchdown. December 8, 2005 Lost communication with the earth due to operation rupture by fuel leakage. 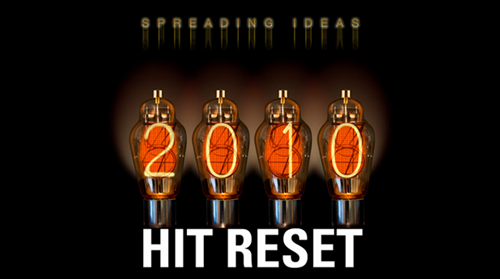 January 26, 2006 Resumed communication and operation. January 18, 2007 Sample-catcher was actually transferred into the recovery capsule, and latched and sealed. February, 2007 The ion engines ignited and operated again. April 25, 2007 The homeward journey with an ion engine drive was started. 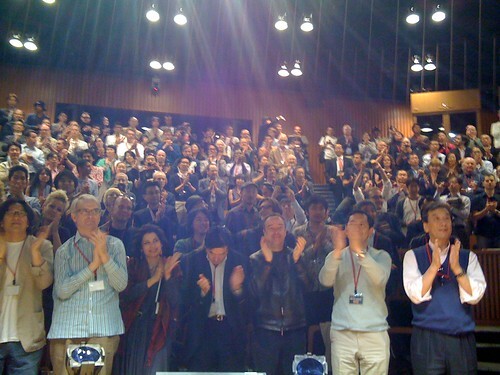 October 18, 2007 Finished first phase orbit maneuver toward Earth. End of May, 2008 Reached the farthest deep space from the Earth. February 4, 2009 Firing ion engine and starting second phase orbit maneuver to return to Earth. November 4, 2009 Ion engine anomaly. 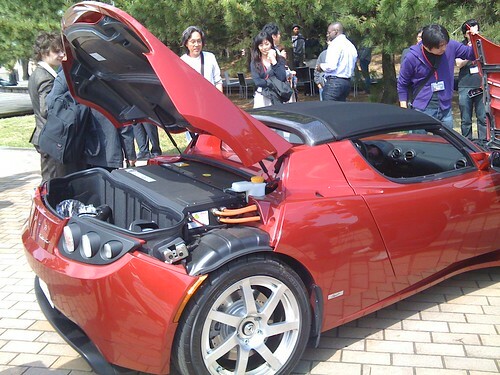 November 19, 2009 Resumed cruise by combining two partially working ion engines. March 27, 2010 Finished second phase orbit maneuver toward Earth. June, 2010 Back to the Earth , capsule recovered. I've been writing a lot about Hatsune Miku, Vocaloid and NicoNicoDouga on this and my other blogs. I thought it might be good timing to do a recap. Hatsune-Miku is a DTM (Desktop Music) software created by a company called Crypton Future Media(ja). It was released in 2007,and was the best selling DTM software then. (DTM software that sells 1,000 copies are supposed to be hit- Hatsune-Miku sold 30,000.) Its price is 15,000JPY. 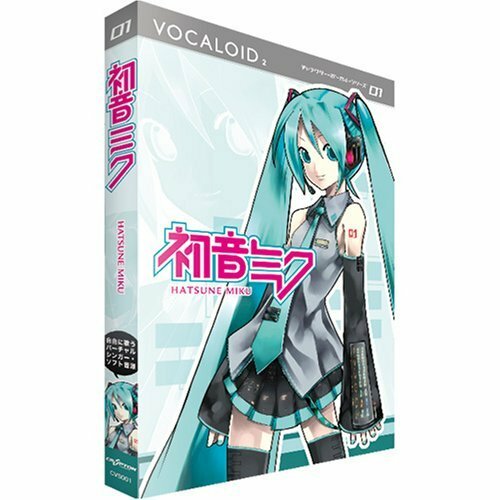 Hatsune-Miku and the Vocaloid series (#1 was Hatsune Miku, #2 was Kagamine Rin & Len, #3 was Megurine Luca) created a completely new phenomena in Japan where people who had never created music (just listens or hums or sings in Karaoke etc) started creating original music using Hatsune-Miku. Just like what blogs did in text world, what Youtube did in video world, Hatsune-Miku opened up a possibility of "consumer generated music" market in Japan. Already 3 years have passed since its release, and the energy of the creators has not faded. 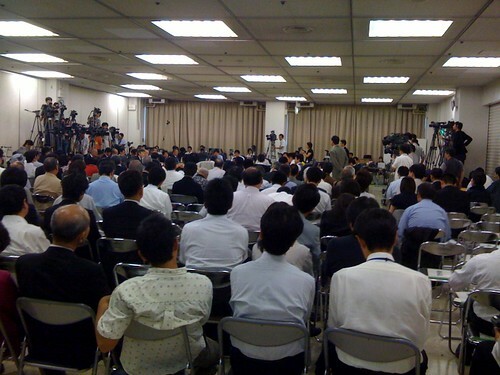 I wrote a blog post about the decline in the music industry in Japan here. One of the exceptions was Vocaloid. "EXIT TUNES PRESENTS Vocalogenesis" (a music album created with Vocaloid software)was #1 for 5 days in a row on Oricon album daily ranking, and was #1 for the weekly sales ranking for the week of 2010/5/18～22. This is the weekly ranking of a Karaoke company -JOYSOUND as of 2010/5/28. Vocaloid series stimulated people’s creativity- not only did people create music, but people who heard the music started to draw amazing pictures, animes, and 3DCGs etc for the music. Some even created a free software to create 3DCG (MikuMikuDance). The reason why this happened owes largely on 1) the strategy of Crypton Future Media to use a cute character image as well as to use the voice of a famous anime voice actor (rather than just creating a DTM software), 2) Crypton's policy to open up the character (Miku) for the amateur creators to make parodies. You can't imagine Disney allowing people to create parodies of Mickey Mouse, Nintendo allowing people to create parodies of Pikachu, but that's what Crypton did. And they even created a website "Piapro" (ja) where people can upload their parodies. And the CEO of Crypton (Mr. Hiroyuki Ito) LOVES those derivative works. Also, the great thing about this remix culture is that people provides their creatives with love, and people remixes them with love and respect for the creator, and they are creating positive cycles around creativity. The fact that the character is open for remix, most music created using Miku is open (and generally creators loves it when their music is remixed, sung, played with musical instruments, made into anime or other creatives- because it increases their views too. ), and further remixes are generally welcomed. You don't have to worry about copyright infringement even though you are remixing a high quality content- that's a big benefit for creators! Asahi Newspaper has been creating a bunch of videos to introduce Hatsune Miku to their audience. This one covers overall aspects of Hatsune Miku. This video covers one of the AWESOME video creators "Tripshots" who creates Hatsune Miku videos.